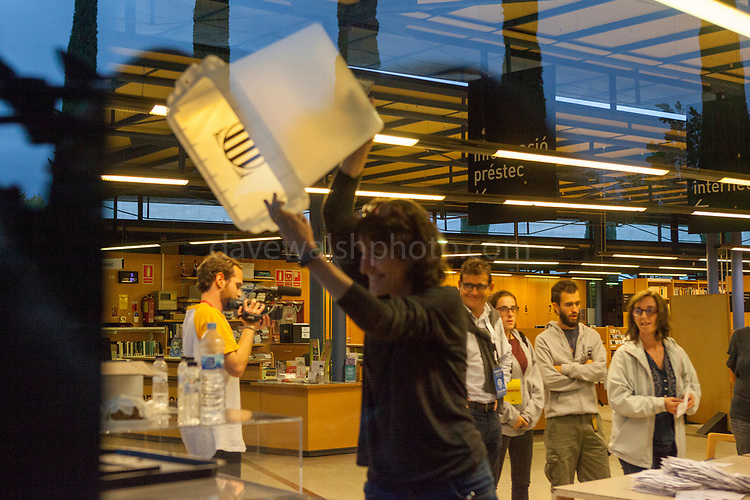 Election official displays empty ballot box as counting starts at Biblioteca Central Gabriel Ferrater, Sant Cugat del Valles, just outside Barcelona, Catalonia, for the Catalan Independence Referendum. October 1st 2017, Catalans voted in a binding referendum to decide whether the region should stay in Spain, or leave and become an independent Republic. The Madrid government of Mariano Rajoy sent thousands of extra police into Catalonia, brutally attacking around 10% of voting centres and seizing ballot boxes, injuring nearly 1000 people in an effort to stop the vote. Despite the violence, there was turn turnout of well more than 42% with around 90% in favour of independence. Some 770,000 votes from an electorate of 5.5 million were stolen by police forces or unable to be cast because of raids.